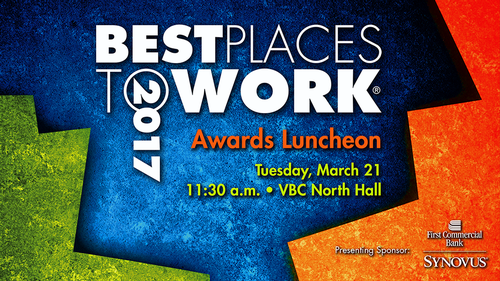 Several companies took home awards today during the Chamber of Commerce of Huntsville/Madison County's Best Places to Work ceremony. The 10-year-old event recognized "the best of the best" Chamber-member businesses in the Tennessee Valley. Winners were determined based on input from employees. Businesses were honored in the micro (10-20 employees), small (21-50 employees), medium (51-100 employees), large (101-250 employees) and extra large (251 or more employees) categories. Silver: New Beginnings Family Law, P.C. Silver: Nesin Therapy Services, P.C. Gold: Modern Technology Solutions, Inc.
Click here to read this article on AL.com.